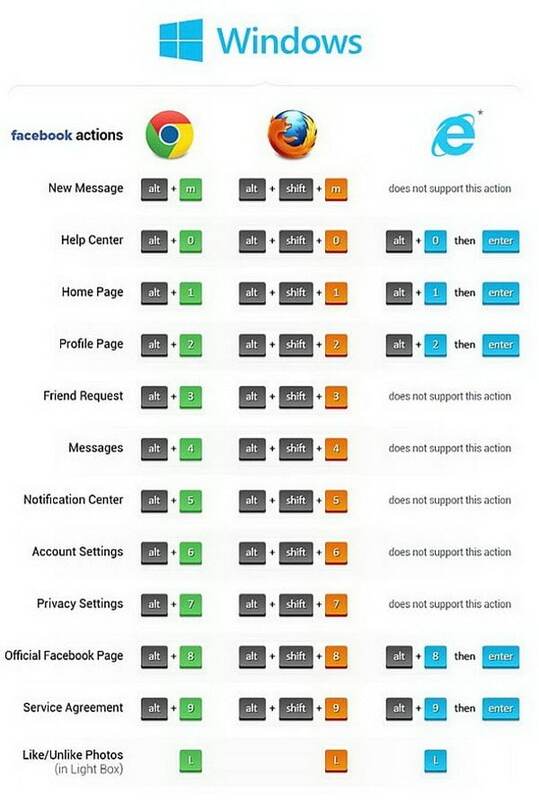 Web browsing keyboard shortcuts for Mozilla Firefox, Google Chrome, Internet Explorer, Apple Safari, and Opera. Each browser has some of its own specific shortcuts but most shortcuts we have listed will work with all browsers. Here we will show you the ones that will make web browsing faster and simplified. We have added some helpful mouse actions in the list below. 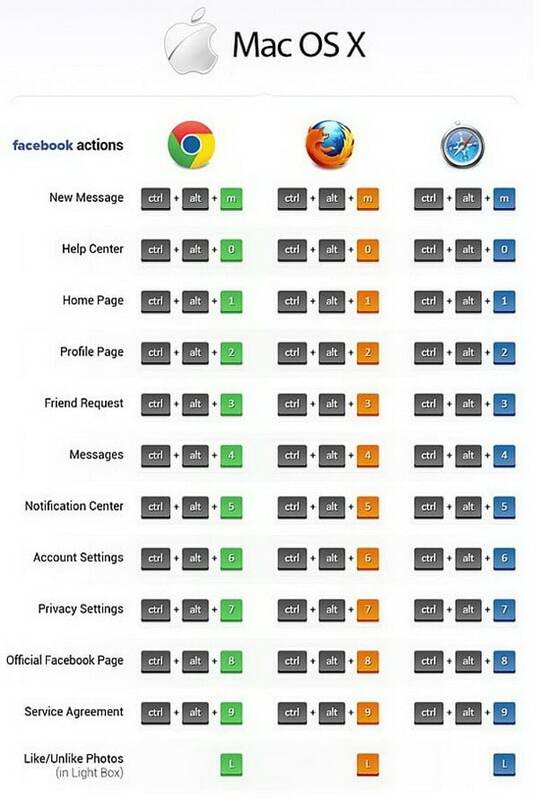 We have also included Facebook Keyboard Shortcuts charts at the bottom of the page for use with Windows and Mac. 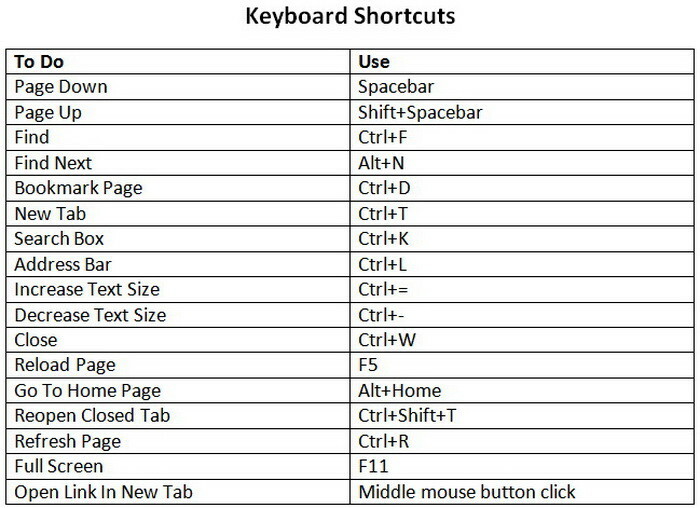 Learning keyboard shortcuts when using Facebook can really make things go faster which results in a better user experience. Alt + Home = Open homepage. Alt + Left Arrow = Back. Alt + Right Arrow = Forward. Ctrl + F5 = Reload and skip the cache and re-download the entire website. Escape = Stop current action. Ctrl + 1 through 8 = Switches to the specified tab, counting from the left. Ctrl + Tab = Switch to the next tab on the right. Ctrl + Shift + Tab = Switch to the previous tab on the left. Ctrl + T = Open a new tab. Ctrl + N = Open a new browser window. Ctrl + W = Closes the current tab. Ctrl + Shift + T = Reopens the last closed tab. Alt + F4 = Close the current window. Ctrl + Left Click = Opens a link in a background tab. Shift + Left Click = Opens a link in a new browser window. Ctrl + Shift + Left Click = Open a link in a foreground tab. Ctrl and + or Ctrl + Mousewheel Up = Zoom in. Ctrl and – or Ctrl + Mousewheel Down = Zoom out. Ctrl + 0 = Default zoom level. F11 = Full screen mode (press again to end full screen). Space or Page Down = Scroll down a frame. Shift + Space or Page Up = Scroll up a frame. Home = Top of page. End = Bottom of page. Middle Click = Scroll with the mouse. Ctrl + H = Open the browsing history. Ctrl + J = Open the download history. Ctrl + D = Bookmark the current website. Ctrl + Shift + Del = Open the Clear Browsing History window. Alt + Enter = Open the location in the address bar in a new tab. Ctrl + L or Alt + D or F6 = Go to address bar so you can begin typing. Ctrl + Enter = Will add www. and .com to the text in the address bar and then load the website. For example, type removeandreplace into the address bar and press Ctrl + Enter to open www.removeandreplace.com. Ctrl + K or Ctrl + E = Focus the browser search box or focus the address bar. Alt + Enter = Perform a search from the search box in a new tab. Ctrl + F or F3 = Open the in-page search box to search on the current page. Ctrl + G or F3 = Find the next match of the searched text on the page. Ctrl + Shift + G or Shift + F3 = Find the previous match of the searched text on the page. Ctrl + O = Open a file from your computer. Ctrl + U = Open the current page’s source code. Ctrl + P = Print the current page. Ctrl + S = Save the current page to your computer.